What motivated the people to break their promise about doing business on the Sabbath? What can you do to safeguard against regression and/or going back on commitments that you have made? How did Nehemiah react? What can we learn from his reaction? Was he too extreme/aggressive in his response to the traders? Why or why not? Ephesians 5:11-12 – Have nothing to do with the fruitless deeds of darkness, but rather expose them. It is shameful even to mention what the disobedient do in secret. Psalm 94:16 – Who will rise up for me against the wicked? Who will take a stand for me against evildoers? James 5:20 – Whoever turns a sinner from the error of their way will save them from death and cover over a multitude of sins. Isaiah 5:20 – Woe to those who call evil good and good evil, who put darkness for light and light for darkness, who put bitter for sweet and sweet for bitter. James 4:4 – You adulterous people, don’t you know that friendship with the world means enmity against God? Therefore, anyone who chooses to be a friend of the world becomes an enemy of God. The Jews were basically exploiting what they may have considered to be a loophole in the law. While some of them were not breaking the letter of the law, they were breaking the spirit of the law. For example they might have said something like, “We are not allowed to transport items for selling, but there is no law saying we can’t buy from someone who does.” A similar example would be a farmer saying, “I am not working in the field, I am only watching the person I am paying to do the work in the field.” This law should not have been reduced to a list of things they weren’t allowed to do. The purpose of the law was to rest from their normal activities for the purpose of honoring God. While going to walk around a busy market may not have expressly broken any laws, it was certainly not what God intended for this day. They were enabling other people to break God’s law. See Exodus 20:8-10. It is sin to do work on the Sabbath. I will not do work on the Sabbath. But I will pay someone else to do the work for me on the Sabbath. What is the matter with this thought process? Application: We should not look the other way while other people sin. Neither should our behavior enable other people to sin. We do not want to cause anyone to stumble. It is not wrong for me to have a drink of wine, but should I encourage a recovering alcoholic to do so? The Bible says it is wrong to take a bribe, but is it wrong to give a bribe? We should evaluate our actions to make sure both that we ourselves are not sinning and that we are not contributing to or enabling someone else to sin. We need to be mutually responsible to help those around us by discouraging them from sin and holding them accountable so that they won’t sin. Then I reprimanded the nobles – See cross-references on exposing sin. Nehemiah doesn’t turn the other way. He doesn’t ignore the problem. He doesn’t sweep it under the rug. He doesn’t minimize it. He sees a sin problem and he confronts it head on. Neither does he candy-coat it. Instead he calls it “this evil thing” and “profaning the Sabbath.” He is so uncomfortable about the sin, he cannot remain silent. His conscience demands that he speak out. When he does he doesn’t beat around the bush. Application: In the modern world speaking out against sin is not considered virtuous. Tolerance and understanding are instead valued. People who speak out against sin may be labeled as “bigots,” “haters,” or “religious freaks.” Certainly we should care about people’s feelings. We shouldn’t hurt people’s feelings for no reason. We shouldn’t say things with the purpose to hurt others. However, we should care about the truth more than we care about people’s feelings. We should care about the truth more than we care about people’s emotions. If speaking out the truth causes someone to get their feelings hurt, this should not keep us from saying what needs to be said. Verses 19-21 – Nehemiah was not only a good motivational speaker. He was a man of action. He saw a problem. And he took action to deal with it. He commanded that the gates be closed and the traders/merchants not even be allowed in to the city. Many of the traders and merchants did not listen to the new policies that they were not welcome to trade on the Sabbath day. Thinking of the amount of money they could make, they decided to camp outside the walls in hopes this policy would be reversed. Nehemiah stopped this idea quickly by threatening physical force against anyone who camped outside the walls. What do you think of Nehemiah’s threat? Was he too extreme? Let’s look at the result. It was effective. Verse 21 tells us that “from that time on they did not come on the Sabbath.” We should note that Nehemiah was the governor. He had the authority to command that the gates be shut. And he had authority to threaten (and to use) force on those who didn’t listen. He was not overstepping his authority. He was using his authority to glorify God and edify his people. What can we learn from Nehemiah’s reaction to all of these problems? How can we apply what we learned to our own lives? Verse 22 – Nehemiah restores the Levites to their proper positions and shows them how they can start serving God again. Their first task is to serve as gatekeepers to keep the traders and merchants out on these days. In addition, they are to consecrate this day. Remember me – Nehemiah asks God to remember him for what he had done. This is the same request he makes in verse 14. We ourselves would only want to pray this if we were serving God faithfully. Otherwise we would want God to forget what we had done. Let us ask God to give us the strength to serve Him faithfully, believing and knowing that He will reward us for the things we do for Him while we are on this earth. What was the reason they should not marry foreigners? Was his reaction too extreme/aggressive? Why or why not? What principles can we learn from him? Should we also react to sin like he does? 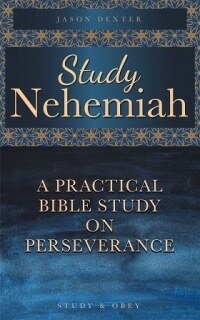 What example does Nehemiah give? What can we learn from the fact that both he and we today give Solomon as an example of the dangers of marrying an unbeliever? Deuteronomy 7:3 – Do not intermarry with them. Do not give your daughters to their sons or take their daughters for your sons. The people had intermarried and their children couldn’t even speak the language of Judah – In the past chapters we have looked at this problem several times. Unfortunately though there were periods of victory and repentance those times of victory were short-lived. Once again the people were falling into this sin. Part of the reason was that Nehemiah was gone. When he was gone no one kept them accountable. We need to make sure someone is keeping us accountable. One result of these intermarriages was that it effected the children as well. Many of these children could not speak the language of Judah. Is it likely that their parents were teaching them to worship and honor Jehovah in foreign languages? Very doubtful. Speaking in foreign languages was one external sign that the children were losing their own culture and following the foreign culture, including giving up worship of the one true God (whose law was written in Hebrew) and worshiping idols. Application: When someone sins, his sin will effect other people. In few other areas is this as evident as the sin of marrying unbelievers. It is very difficult for a parent to raise his/her children to believe and honor God if his/her spouse does not do so himself. Why is it so difficult? It takes a lot of time to teach someone about God – Both the mom and the dad need to expend a lot of time to raise their children to know God. If one parent does not, then the burden falls completely on the other parent and a lot of times they don’t have enough time or commitment to do it well. It takes a lot of discipline to raise a child correctly – Discipline will be most effective when mother and father agree and support each other. Imagine a case (and it is not hard to imagine as I have heard of many) where the father refuses to discipline his children (or even forbids the wife to do so) and the wife tries to discipline the child on her own. How will the child view this? It takes a lot of prayer to raise a child – If only one parent is a believer you lose half the prayer support. The unbeliever will generally not only be an absent/neutral party, but will actively teach the child many things that are contrary to the word. Nehemiah contended with them – He cursed them, struck them, and pulled out their hair. Let’s open up the table for comments on this. What can we learn from Nehemiah? Was he too extreme? Too violent? Should we do this? Why or why not? If not this, then what should we do? Nehemiah gives Solomon as an example – From this we learn that truth doesn’t change. Nehemiah understood the story of Solomon in the same way that we do today. He applied the same principles of interpretation as we should. The lessons and the conclusion from the story of Solomon is the same now as then. The truth of that story did not change in between the time of Solomon and Nehemiah and it hasn’t changed from the time of Nehemiah until now. From this we learn that the Bible is not an allegory. We cannot seek to interpret the Bible by starting the question “what does it mean to me?” It doesn’t mean different things to different people (or it shouldn’t.) It also doesn’t mean different things in different times or in different culture. Truth is unchanging. There is only one correct interpretation, only one correction understanding of any given text. There are many applications, but one, unchanging truth. If Solomon fell so can we – Solomon was not immune to the temptations of sin. His wisdom and knowledge and love for God did not prevent him from sinning. Neither are you immune. How can we take steps to guard against going down the path of Solomon? See 1 Peter 5:8. Nehemiah drove away those who disobeyed – He refused to compromise. He didn’t just talk the talk; he walked the walk. Nehemiah was an “all in” type of person. He realized that a person either obeys God or He doesn’t. And if a person obeys God, he should obey God in every area, not just the convenient areas. Then I purified them – Nehemiah is not satisfied with the work that has been done. He is not satisfied with the changes he has helped to instill. He wants to make sure that the right environment is created such that these positive changes will continue forward into the future. With that vision in mind, he appointed duties for all of the priests and Levites. Nehemiah was only one man. It was their job to ensure that a good model was set for the people and to help make sure that these lapses into sin did not happen again.